There is nothing like Old Fashioned, Homemade, Banana Pudding. This recipe is manna from Heaven to a Southerner! Today I’m thrilled to bring you a recipe video for the first recipe I ever posted on SouthernPlate! The printable recipe is below the video. If you’d like to see my original post from 2008 with step by step photos (and a lot more commentary), please click here. There is nothing in this world like real homemade banana pudding. I hope you get to wrap your hands around a bowl soon! In sauce pot (or double boiler) on medium low heat, add all ingredients except for vanilla. Stir well with wire whisk. Allow to cook, stirring constantly to prevent scorching, until thickened - about fifteen minutes. Add in vanilla and stir. Immediately pour over wafers and bananas. Whip egg whites until foamy. Add sugar. Continue beating on high speed until soft peaks form. Pour onto top of pudding and spread to edges to seal well. Bake at 325 for ten minutes or until top is golden. Check out my Frozen Banana Pudding by clicking here! 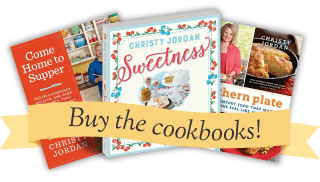 Lemon Berry Cream Cheese Muffins & FREE E-Cookbook! Husband makes his with at least 6 eggs! The butter makes a real difference! I don’t use a double broiler, just a heavy bottomed sauce pot. I’ve tried it in the microwave before because wonderful folks like you say you do it that way, but it has never worked for me. Perhaps my microwave is too powerful. Alas, I have to stick to the stovetop but I’m glad to know there is a shortcut out there! My mother didn’t use a double boiler either. She made it like yours except she always used evaporated milk. And being a country girl, she didn’t measure anything. She just used this and that. It was always delicious and I go by her recipe but I have to measure everything. Wish she could make me one now. I never got into the boxes of pudding mix, just plain old ingredients found in my fridge nd pantry. Yes, Christy I was blessed with wonderful parents. I miss them so much. I hit submit before I was ready to. I was going to tell you that she always made chocolate pie th same way, in a heavy pot on the stove. When she finished making the pudding and pie she would give me a spoon to eat the rest out of the pot. I learned to cook when I was five and stood in a chair to help her. Her mother was also a good country cook but that’s a story for another day. After I found you I have unsubscribed to most of my cooking sites. Yours is wonderful and southern. I am from south Alabama. 🙂 Standing in a chair, making memories that last a lifetime. Those are the best kind of days!!! Thank you so much for your support Peggy, it is much appreciated!! I am from North Alabama and my mom and grandmother used the same receipt. My grandma used evaporated milk so of course I do too. I’ve been known to quadruple the recipe, (yes, I used a dozen eggs!) to make a pudding big enough for homecoming at church and family reunions. Be warned, once you show up with it you’ve made a commitment to bring it to several more get together. Do you replace equal amount of milk for evaporated milk? Since I’ve started making my own the box stuff never crosses my mind. 🙂 homemade is so much better isn’t it? Oh my goodness, my mouth is watering! Banana Pudding is my absolute favorite. My sister always makes me a big bowl of it for my birthday every year. We always make it the way you do…..with the meringue on top. There is nothing any better! It is one of my favorites too Tonya!!! YUM!!! I like to use slightly ripened bananas! 🙂 It sure is good isn’t it?! Hi Vicki!!! I am so glad you decided to comment, I love getting to know each and every one of my readers!! I hope you get the chance to make a batch of banana pudding and cherish the sweet memories of your Mama!! PS… I left out the most important point to your banana pudding! It is identical to my Mothers!!! Takes me bake home many years ago. There were no box this box that just Mom’s cooking. I love these videos, thanks! 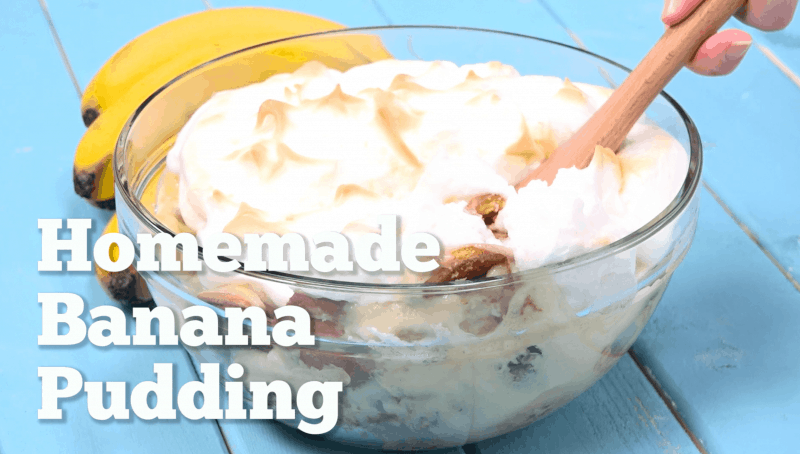 Hi Christy, I’ve never made homemade banana pudding before but I’m gonna try this. It sound like my granny’s. I thought it was a lot of trouble but your video seem simple enough. Thank you. I hope you try it soon Kathy, it isn’t hard at all!! This was my Grandmothers recipe also. She cooked on an old wood burning stove. The best soup bean, cornbread and blackberry pudding ever made! I can do the banana pudding, but not the blackberry cobbler. I don’t know how she kept from burning this up, but she did. Isn’t it amazing how good their food was? I am not sure how I would fair using the tools they used, I sure do admire that generation!! Homemade Banana pudding beats the box stuff any day. My family likes me to add crushed pineapple (small can drained) to the pudding as it cooks. I cut the milk back by about 1/3 cup. I take the drained pineapple juice and put over the bananas which helps the bananas to keep from turning brown before assembling the layers. I also let the pudding start to cool down some before adding to the wafers and bananas. This also helps keep the bananas from turning so quickly. Finish off as you have listed. Always enjoy your recipes!! Hi Christy, I have a question about using Sweetened Condensed Milk. I know you don’t like using boxes & I respect that but I don’t have time to make it the best way. Several recipes I have seen call for milk and sweetened condensed milk – do you think it would be too sweet to add the sweetened milk to the boxes of pudding? Thank you!! 😀 No, I don’t have your book yet – I will look into that! I want to make this to serve for Easter. Can I double the recipe, and I’d it alright to make it a day ahead? Sorry I am just now seeing this Lisa, I didn’t get on the computer much this weekend. You could have doubled it and made it ahead.